The Selection is book 1 in The Selection series. I've seen a few of the book bloggers I follow enjoy this series so it's been on my radar for awhile now. I'm glad my library had the audiobooks so I could binge listen to them so expect reviews for the following two books within the next few weeks. 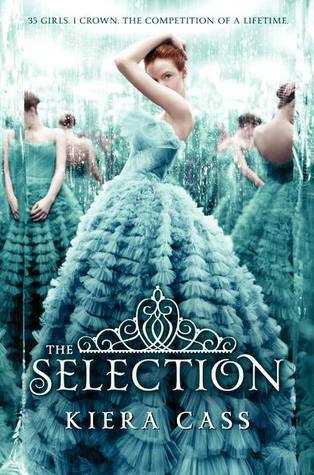 I wasn't really sure what to expect from The Selection but it really wound up impressing me. We start out meeting our leading lady, America Singer, she's one of the lower casts, a 5 (ranging from 1 being royalty to 8 being the lowest) and helps earn money for her family preforming at parties singing or playing the violin. She's been secretly seeing a boy named Aspen, a 6 on the sly so neither gets in trouble and hoping one day they can get married. Her family receives a letter saying that Prince Maxon has hit the age where The Selection is going to happen. Basically think The Bachelor but with 35 ladies vying for the Prince's heart. America wants nothing to do with it, but Aspen and her family push her to enter in the chance she might become the next Princess. Hurt and not sure what to do with her life, America relents and she winds up being accepted into the Selection. Most of our book is seeing the daily lives of the girls and the Price at the palace and while some cattiness comes about with all the girls, it was interesting seeing America try to figure out who she is and what she wants with her life. The Selection is like a guilty pleasure read for me. It's not my typical genre but I'm really glad I tried it out because it was entertaining. I was happy to start out seeing America with her family then transitioning into the palace environment since it showed with a huge difference being in the different casts involves. Prince Maxon is a sweetie and really took a shine to America and it'll be interesting seeing how it plays out. All in all, if you like YA/NA Dystopian novels you should check this series out.